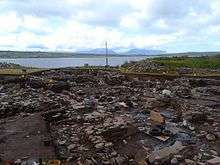 Excavations at the Ness of Brodgar. The Ness of Brodgar is an archaeological site covering 2.5 hectares (6.2 acres) between the Ring of Brodgar and the Stones of Stenness in the Heart of Neolithic Orkney World Heritage Site in Orkney, Scotland. Excavations at the site began in 2003. The site has provided evidence of decorated stone slabs, a stone wall 6 metres (20 ft) thick with foundations, and a large building described as a Neolithic temple. The earliest structures were built between 3,300 and 3,200 BCE, and the site had been closed down and partly dismantled by 2,200 BCE. 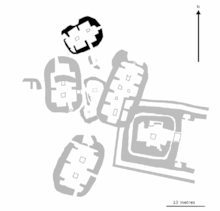 General plan of the site. Today the Brodgar peninsula is a finger of land a few hundred metres wide, situated between the saltwater Loch of Stenness to the southwest and the freshwater Loch of Harray to the northeast. To the southeast are the Standing Stones of Stenness and to the north-west is the Ring of Brodgar. A short bridge connects these two sites. Also visible from the site are, to the east, the chambered cairn at Maeshowe and, to the southeast the Barnhouse Settlement. A couple of kilometres northwest of the Ring of Brodgar is the Ring of Bookan, a third henge, with associated mounds. The Neolithic village at Skara Brae lies a few kilometres away, as does the chambered cairn at Unstan. More archaeology is probably submerged beneath the lochs. In Neolithic times, the Loch of Stenness was probably a wetland area rather than a lake. 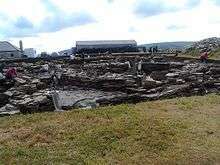 People from Skara Brae would have been able to walk to the Ness of Brodgar, watch or take part in ritual activity and walk home within a day. The structures at the Ness of Brodgar are made of flagstone, a sedimentary rock found abundantly throughout Orkney. Flagstone is easily split into flat stones and was therefore a good material for fine building work using Neolithic tools. Some of the stone found on site is too thin for floor tiles or wall building, and is understood as the first evidence ever found of stone roof tiles. 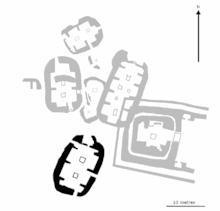 The structures at Brodgar are numbered in the order of discovery. 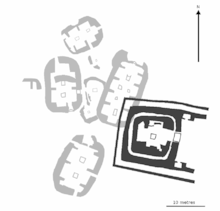 As more of the site was uncovered and the interpretations improved, some numbers went out of use, so as of 2016 the key structures are numbered 1, 8, 10, 12 and 14. Structures 1, 8, 12 and 14 appear to have been constructed around 3,000 BCE. These stand on top of earlier remains that, as of 2016, have not yet been uncovered, but are thought to date to 3,300-3,200 BCE. Structure 1 as it appeared in July 2016. Structure 1 has a complex history and appears to have been built on top of the remains of an earlier structure. The official guide to the dig suggests that this structure appears to have been central to the site. Originally it was more than 15 metres (49 ft) long, but was radically rebuilt within about a century of its first construction: two doors were blocked up, a new door was inserted and a new wall built. It was decorated with many pieces of stone artwork, some of which were internal to the walls and would never have been seen while the building was in use. Some of the individual stones of structure 1 were painted in yellows, reds and oranges using ochre pigment made of haematite mixed with animal fat, milk or eggs. This is the first discovery in Britain of evidence that Neolithic people used paint to decorate their buildings. In 2015 the bones of a baby, which died around the time of birth, were unearthed in a recess of this building. In this image taken in July 2016, structure 8 is visible to the rear. The prominent structure is structure 11. 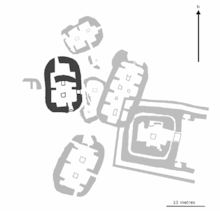 Structure 8 is roughly contemporary with structure 1, probably having been built just after structure 1 was completed. It comprised ten piers and ten recesses, and had six hearths. The remains of at least two earlier buildings lie beneath it and structure 8 appears to have undergone severe subsidence itself. Its floor slumped in antiquity, causing the roof to fall in, and some of its stones were used to form structure 10. Structure 8 was the first place where stone roof tiles were discovered on site and the first place where coloured pigment was found on the walls. Uniquely among the buildings of the Ness of Brodgar, and indeed uniquely in Neolithic Europe so far as we know, finely-worked stone spatulas were found here. They resemble flattened spoons and have been made with great care. None of them show signs of wear and their purpose is unknown. Other finds from this structure included a whalebone mace head and a whale's tooth set in stone. This image taken in July 2016 shows archaeologists at work on structure 10. Structure 10, described as "temple-like", was discovered in 2008. It has walls 4 metres (13 ft) thick and still standing to a height of more than 1 metre (3.3 ft). The building is 25 metres (82 ft) long and 20 metres (66 ft) wide and a standing stone with a hole shaped like an hourglass was incorporated into the walls. There is a cross-shaped inner sanctum and the building was surrounded by a paved outer passage. It is believed to have been constructed around 2,900 BCE. This is the largest structure of its kind anywhere in the north of Britain and it would have dominated the ritual landscape of the peninsula. Structure 10 appears to have been partly rebuilt around 2,800 BCE, probably due to structural instability. It was used until around 2,400-2,200 BCE. At this time it appears to have been "closed" in an extraordinary and unique episode of demolition involving the slaughter of several hundred cattle. Bones of approximately 400 cattle—tibias (shin bones) comprise the vast majority of bones found—were laid around structure 10 and an upturned cow skull was placed within it. The tibias appear to have been cracked to extract the marrow, suggesting that this slaughter was accompanied by a feast. All the killing seems to have taken place in a single event. After the feast, the whole carcasses of several red deer were placed atop the broken bones, and structure 10 was largely destroyed. This event appears to have marked the closure and abandonment of the Ness of Brodgar site. Structure 12 in July 2016. Just visible at the back of this photograph is celebrity archaeologist Neil Oliver. Structure 12 was built around 3,000 BCE. It comprises six piers, four recesses and two hearths. It is the southernmost structure so far uncovered, but there are believed to be more structures farther south still under ground (some of which, unfortunately, may be under the site's spoil heap). It was made of well-dressed stone but like several other buildings on the site, appears to have suffered from structural problems and was partly rebuilt. An annexe to the north, added later in the Neolithic, is not well-integrated into the original stonework. This annexe contained masses of Grooved ware pottery, including some very large vessels, some made with techniques not otherwise known from the Neolithic, and some coloured black, red or white. The red colour was made of ochre, and the black of soot; the source of the white colouring has not yet been determined. The grooved ware from Orkney is the oldest known in Britain, and the style appears to originate from Orkney and radiate southwards. Structure 14 as it appeared in July 2016. The tarpaulins visible in this image are left over from when the site was covered and closed down (dig re-started 4 July). The tyres were used to weigh them down. Structure 14 was build around 3,000 BCE, roughly contemporaneously with structures 1, 8 and 12. Like them it was built on top of earlier structures. It is the most northerly of the buildings so far uncovered. It has three entrances, four piers, four recesses and two hearths. Apart from its size it is generally similar in design to structure 8. A great deal of stone from structure 14 was taken in antiquity for re-use elsewhere, and like all the other structures except structure 10, it appears to have been largely demolished by 2,600 BCE. The ends of this building appear to have been used for different purposes and as of 2016, the floor is undergoing chemical analysis to determine what they were. An unusual axehead, made from gneiss, and a carinated bowl from the early Neolithic which may pre-date Grooved Ware, have been found in this structure. Excavations have revealed several buildings, both ritual and domestic, and the works suggest there are likely to be more in the vicinity. Pottery, cremated animal bones, stone tools, and polished stone mace heads have also been discovered. Some of the stone slabs are decorated with geometrical lozenges typical of other Neolithic sites. 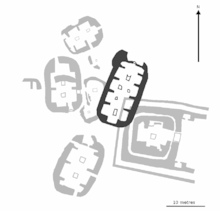 There are the remains of a large stone wall (the "Great Wall of Brodgar") that may have been 100 metres (330 ft) long and 6 metres (20 ft) or more wide. It appears to traverse the entire peninsula where the site is located, and may have been a symbolic barrier between the ritual landscape of the Ring and the mundane world around it. A baked clay artefact known as the "Brodgar Boy", and thought to be a figurine with a head, body, and two eyes, was also unearthed in the rubble of one structure in 2011. It was found in two sections, the smaller of which measures 30 mm, but is thought to be part of a still larger object. In 2013, an intricately inscribed stone was found in structure 10, described as "potentially the finest example of Neolithic art found in the UK for several decades". The stone is inscribed on both sides. A few days later archaeologists discovered a carved stone ball, a very rare find of such an object in situ in "a modern archaeological context". Recent finds include Skaill knives and hammer stones, and another, perhaps even bigger wall. 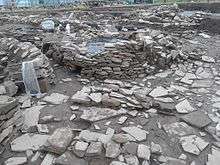 The dig involves archaeologists from Orkney College and from the universities of Aberdeen, Cardiff and Glasgow. The monuments at the heart of Neolithic Orkney and Skara Brae proclaim the triumphs of the human spirit in early ages and isolated places. They were approximately contemporary with the mastabas of the archaic period of Egypt (first and second dynasties), the brick temples of Sumeria, and the first cities of the Harappa culture in India, and a century or two earlier than the Golden Age of China. Unusually fine for their early date, and with a remarkably rich survival of evidence, these sites stand as a visible symbol of the achievements of early peoples away from the traditional centres of civilisation. ... Stenness is a unique and early expression of the ritual customs of the people who buried their dead in tombs like Maes Howe and lived in settlements like Skara Brae. Since the importance of the Ness was discovered only in 2003, it was not mentioned explicitly in 1999 and was not one of the four key sites. Nevertheless, the Ness of Brodgar "contribute[s] greatly to our understanding of the WHS" according to Historic Scotland. Westray Wife - another Neolithic figurine recently discovered in Orkney. 1 2 3 4 Towers et. al. 2015, pp 22-23. 1 2 Towers et. al. 2015, pp 2-3. ↑ Towers et. al. 2015, p.11. ↑ Towers et. al. 2015, p.10. 1 2 Towers et. al. 2015, pp18-19. ↑ ...and painted walls, The Ness of Brodgar Trust, retrieved 10 July 2016. ↑ "Painted walls in Orkney '5,000 years old'". BBC News. 26 July 2010. Retrieved 12 July 2016. ↑ Dig diary, 25 August 2015, The Ness of Brodgar Trust, retrieved 10 July 2016. 1 2 3 4 5 6 Towers et. al. 2015, pp20-21. ↑ Prehistoric roof tiles, The Ness of Brodgar Trust, retrieved 11 July 2016. ↑ Dig diary, 6 August 2010, The Ness of Brodgar Trust, retrieved 11 July 2016. ↑ Wickham-Jones 2015, p. 75. 1 2 Towers et. al. 2015, pp 24-25. ↑ A rough timeline, The Ness of Brodgar Trust, retrieved 12 July 2016. ↑ Dig diary, 15 August 2012, The Ness of Brodgar Trust, retrieved 12 July 2016. ↑ Dig diary, 23 July 2014, The Ness of Brodgar Trust, retrieved 12 July 2016. 1 2 Towrie, Sigurd (16 August 2007) "Stone wall hints at Neolithic spiritual barrier " Orkneyjar. Retrieved 17 September 2008. 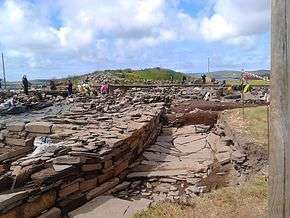 ↑ Ross, John (14 August 2007) "Experts uncover Orkney's new Skara Brae and the great wall that separated living from dead". Edinburgh. The Scotsman. Retrieved 16 August 2009. ↑ "Brodgar Boy" Orkneyjar. Retrieved 28 Aug 2011. ↑ " 'Finest' Neolithic stone discovered at Orkney's Ness of Brodgar". BBC News. Retrieved 10 August 2013. ↑ Dig diary, 7 August 2013, The Ness of Brodgar Trust, retrieved 12 July 2016. ↑ A flaked stone with a sharp edge used for cutting. This neolithic tool is named after Skaill Bay, the location of World Heritage Site Skara Brae in Orkney. See "Skaill knife" (pdf) Historic Scotland. Retrieved 21 March 2007. ↑ Ross, John and Hartley, David (14 August 2009) " 'Cathedral' as old as Stonehenge unearthed." Edinburgh. The Scotsman. Retrieved 16 August 2009. 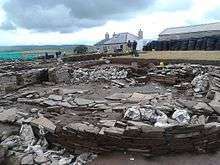 ↑ "Neolithic ‘temple’ revealed at site on Orkney" Glasgow. The Herald. Retrieved 16 August 2009. 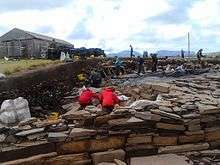 ↑ Macintosh, Lindsay (14 August 2009) " 'Neolithic cathedral built to amaze’ unearthed in Orkney dig" London. The Times. Retrieved 16 August 2009. 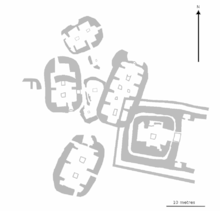 ↑ "The Ness of Brodgar Excavations". (14 August 2009) Orkneyjar. Retrieved 16 August 2009. 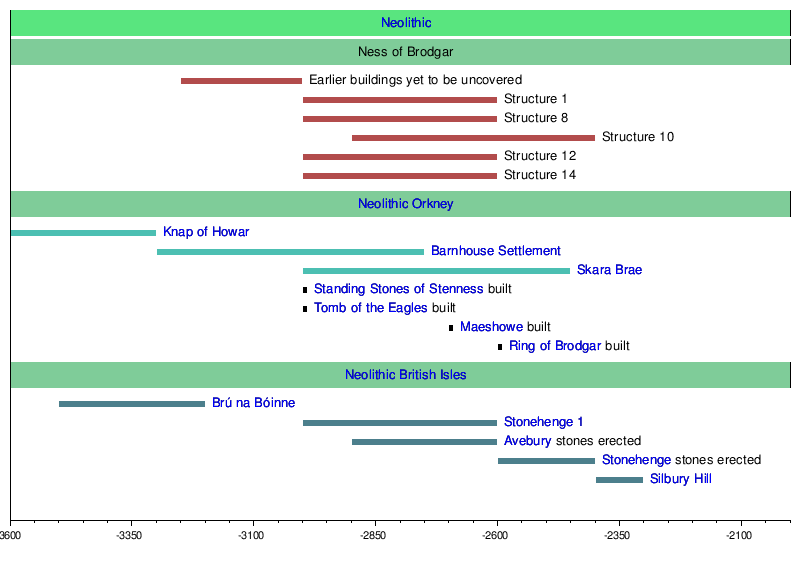 ↑ "The Heart of Neolithic Orkney" at the Wayback Machine (archived 24 August 2007). Historic Scotland. Wayback archive of 5 September 2007 retrieved on 14 October 2012. ↑ Heart of Neolithic Orkney - Management Plan 2014–19: Consultation Draft (PDF). Historic Scotland. 2013. p. 10.